The 21 Jump Street big-screen reboot shouldn't have worked. In the film, the leads, newly graduated officers played by Channing Tatum and Jonah Hill, are told the police department has run out of ideas. Rebranding a once-popular idea was all the creativity the department could muster. That was a message for us, that everyone involved was in on the joke. Even Johnny Depp stopped by to be in on it. Against the odds, 21 Jump Street worked. What does Hollywood do with an idea that works? They do the same thing, naturally. Thankfully, the same team (chiefly co-directors Phil Lord and Christopher Miller) is back and still in on the joke. 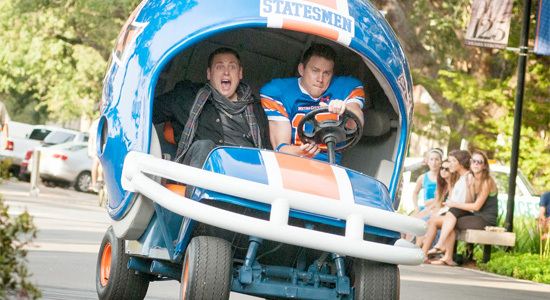 22 Jump Street becomes the Jump Street movie to end all Jump Street movies. Maybe. That’s a hard “maybe,” too, because self-aware or not, the jokes work, the action works, and the team still works. Tatum and Hill return as Jenko and Schmidt, embracing their newfound glory as badass drug busters, Bad Boys-style. However, after a particularly costly bust attempt, the undercover duo is reeled back in and sent back to Jump Street. They’re actually sent across the street; new address, new ethnic denomination of church, and new high-tech toys. The game and most of the players, however, are staying the same. Returning as the head of the Jump Street division, Ice Cube explains they should just do the same thing they did last time, which they do with little fuss. That means Jenko and Schmidt have to "infiltrate the dealers and find the suppliers," this time on a college campus. While the lead characters are reeled in, forced to go through the same motions they’ve been through once before, Lord and Miller and their screenwriting team (which includes Hill) find a way to branch out with the film's comedy. It finds new avenues of comedy, embracing not only the self-referential side of its plot but the actors within it. Tatum makes a comment about wanting to visit the White House. When they first enter their new offices, Hill comments that one looks like a giant block of ice, the one Ice Cube is in. There’s already work on the lot at 23 Jump Street, you know, just in case the duo has to report to a different address for their next assignment. The inside jokes fly fast and furious (there’s also a reference to Fast and Furious in here), not all of them landing precisely as they should. But, with the velocity at which the jokes fly at the audience, it really doesn’t matter that a few slip by with a chuckle and not a belly laugh. Trust me. Those come soon enough. Having their cake and eating it too is all well and good to a point. The self-aware comedy strewn throughout 22 Jump Street is never tiresome, thanks in large part to the commitment of both the directing team and the co-leads, but we'll get to them soon enough. The repetitive winking to the audience that comes from a Hollywood, Summer blockbuster yucking it up about the lack of good ideas in Hollywood is a little eye-rolling. Okay, it's a lot eye-rolling. Fortunately, it's impossible to deny the level of intelligence that went into making this seemingly paint-by-numbers comedy come across with so much creativity. There’s a comfort in just about every aspect that makes up 22 Jump Street. The production team as well as the actors on hand all seem to have left their nerves behind with the first film, and the role they’ve respectively settled into comes across all the more naturally. Lord and Miller, at this point essentially mavens when it comes to varying degrees of comedy, know how to keep it extremely R-rated with rare but noticeable trips to the vulgarity department. The action beats are even rarer than these. 22 Jump Street boasts bigger action set pieces, but most of them are quickly forgotten against the hilarity that continuously ensues. Tatum and Hill echo that comfort found throughout the film. Tatum's comedic timing is becoming as natural a part of his presence as his charisma. Hill, on the other hand, has always kept the audience's laughter firmly in his grasp. With 22 Jump Street, it's hard to complain that neither of them are given much diversity from what they did the first time around. That's kind of the point here, but that comfort level permeates the partnership the characters have built between the last film and this one. Supporting players like Ice Cube and Nick Offerman, returning as their commanding officer, are welcome reminders of all that worked well in 21 Jump Street. Rob Riggle and Dave Franco even pop up for a few, hysterical moments. New cast members like Jillian Bell as a college student obsessed with Hill's character's age and Peter Stormare as a drug dealer named The Ghost are additions worth noting, Stormare filling in a little of the Michael Bay requirements that up 22 Jump Street's action. While that's all well and good, it's really the comedy 22 Jump Street brings to the table that makes it such a worthwhile follow-up. They can joke about rehashing the same ideas over and over again all they want, but Lord, Miller, and the screenwriting team they bring on for these films know how to turn up the comedic ingenuity. Be sure to stick through 22 Jump Street's credits for a quick glimpse at what the future of this series has in store for us. It's basically the filmmakers' way of saying this is it, the franchise should quit now while it's ahead. That's not a realistic decision, and no matter what the team has prepared for future Jump Streets, there's little doubt how hilarious those films will surely be. Very good news. Very nice review. I can't wait to see it. Great review! Had a lot of fun with 22, laughed quite a bit. Just re-read the review because we are finally getting this soon where I live. I really hope this lives up to all the hype I heard.